When we listen to our leaders' vigorous condemnations of the human rights abuses and lack of democracy of Qaddafi's and other authoritarian regimes in the Mediterranean we would do well to bear in mind how new-founded and limited is their concern for human rights, and how likely it is that they will try to co-opt any new governments in the region to their war against sub-Saharan migrants. For in the past decade, as well as cheerfully returning dozens of suspected Islamists to torture under cover of the flimsiest of diplomatic assurances, Britain and Europe have used Qaddafi and other repressive north African regimes as front men for policies causing thousands of deaths in the Mediterranean and beyond. The UK has taken the lead in negotiating worthless no-torture agreements designed to secure the return to Libya, Algeria, Jordan, Egypt, Tunisia of people representing no threat to the UK, but who were opponents of their own countries' repressive regimes. Under cover of these agreements, our government has handed people over knowing what their likely fate would be; foreign office officials readily admitted their regimes were torturing states. Where was our government's concern for human rights then? The Libyan Islamic Fighting Group (LIFG), a Libyan opposition group, has never threatened or committed acts of terrorism or carried out any attacks outside Libya (where it tried to assassinate Qaddafi in 1996). Yet it was proscribed in the UK in 2001, its members and those suspected of membership or association arrested, and attempts were made to deport them to Libya under a no-torture agreement signed in 2007 (and denounced by the courts as not worth the paper it was written on) which many human rights activists believed was part of a deal with Qaddafi. In 1999 similar attempts were made to deport Muslim Brotherhood member Hani Youssef to Mubarak's Egypt despite the lack of credible assurances against torture. EU governments know that Libya has no refugee law or procedures, that Qaddafi does not recognise any obligations towards refugees and does not admit their existence. Knowing this, they nonetheless sub-contracted to Libya the task of keeping them out of Europe. The Mediterranean bristles with military hardware, surveillance equipment, naval patrols along the coasts of Libya, funded by the EU and by Italy, ensuring that migrants and refugees who manage to get through the desert to the Libyan coast are unable to get to Europe. Italian naval patrols and the EU's own border paramilitary force FRONTEX intercept and return to Libya any who evade the coastal patrols to ensure that Europe is not burdened with further asylum seekers. FRONTEX, acting in the name of all Europeans, admits that it does not screen passengers for refugee claims, and neither do the Italians. In our name, our governments discount the basic human rights of the thousands of migrants and refugees seeking protection in Europe - and have relied on Qaddafi as an enforcer in the process. Now, in all the concern being expressed for the victims of Qaddafi's violence and for the thousands of north African and sub-Saharan migrant workers caught up in the events, stranded and unable to get home, we can be sure that Europe is not about to open its borders any time soon. As Migreurop points out in its statement on the developments in the southern Mediterranean,  a minor 'influx' of Tunisians to the Italian island of Lampedusa has sent the EU's migration managers into crisis mode. We have seen the limits of Europe's concern for human rights: it stops at the borders of Europe. See eg Human Rights Watch, Pushed Back, Pushed Around: Italy's Forced Return of Boat Migrants and Asylum Seekers, Libya's Mistreatment of Migrants and Asylum Seekers, 21 September 2009 and Sara Hamood, African transit migration through Libya to Europe: the human cost, (pdf file, 1.4mb), Forced Migration and Refugee Studies, The American University in Cairo, January 2006. 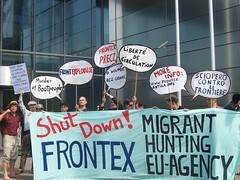 Migreurop, 'The European Union's migration policy: support for dictatorships to the south of the Mediterranean', 23 February 2011.